As far as we know, the first African American woman PhD was Dr. Marie Daly in 1947. I am still searching for an earlier one. Women chemists, especially minority women chemists, have always been the underdogs in science and chemistry. African American women were not allowed to pursue a PhD degree in chemistry until the late in the twentieth century, while white women were pursuing that degree in the late nineteenth and early twentieth century. Racial prejudice was a major factor. Many African American men were denied access to this degree in the United States. The list of those who were able to receive a PhD in chemistry is short. The Knox brothers were able to receive PhDs in chemistry from MIT and Harvard in the 1930s. Some men had to go abroad to get a degree; Percy Julian obtained his from the University of Vienna in Austria. In 1975, the American Association for the Advancement of Science sponsored a meeting of minority women scientists to explore what it was like to be both a woman and minority in science. The meeting resulted in a report entitled The Double Bind: The Price of being a Minority woman in Science. Most of the women experienced strong negative influences associated with race or ethnicity as children and teenagers but felt more strongly the handicaps for women as they moved into post-college training in graduate schools or later in careers. When the women entered their career stage, they encountered both racism and sexism. 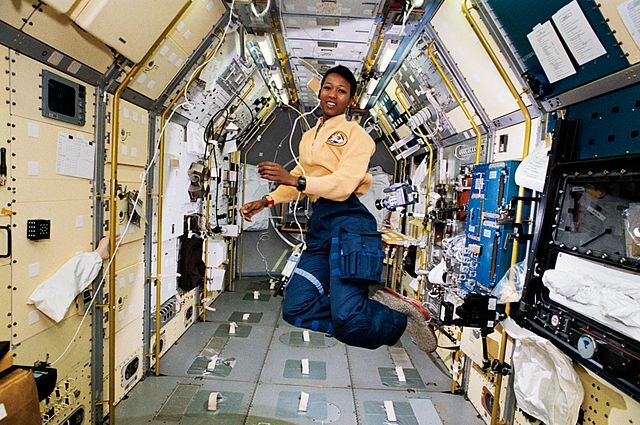 STS-47 Mission Specialist Mae Jemison in the center aisle of the Spacelab Japan (SLJ) science module aboard the Earth-orbiting Endeavour, Orbiter Vehicle (OV) 105. NASA. Public domain via Wikimedia Commons. This is still true today in some respects, but it is often unconscious. For example, the organizers of an International Conference for Quantum Chemistry recently posted a list of the speakers. They were all men (the race of the speakers is not known). Three women who are pillars in the field protested and started a petition to add women to the speakers list. The organizers retracted the speaker list. In 2009 the National Science Foundation sponsored a Women of Color conference. When I attended the meeting and listened to the speakers, it sounded as if not much had changed for women in science. There is still racism and sexism. Even Asian-American women, who do not constitute a minority within the field, were experiencing the same problems. The 2010 Bayer Facts of Science Education XIV Survey polled 1,226 female and minority chemists and chemical engineers about their childhood, academic, and workplace experiences. The report stated that, girls are not encouraged to study STEM (science, technology, engineering, and mathematics) field early in school, 60% colleges and universities discourage women in science, and 44% of professors discourage female students from pursing STEM degrees. In spite of all the negative information in these reports, women are pursuing STEM careers. In the National Organization for the Professional Advancement of Black Chemists and Chemical Engineers (NOBCChE) women dominate the organization. Years ago, men dominated that organization. The current vice president of the organization is a woman chemical engineer, who is is striving to make the organization better. Many of the NOBCChE female members went to Historically Black Colleges (HBCUs) for undergraduate degree before getting into major universities to obtain their PhD. The HBCUs are the savior for African American students because the professors and administration strive to help them succeed in college. I am amazed at all these African American women scientists have done in spite of racism and sexism — succeeding and thriving in industry, working as professors and department chairs in major research universities, and providing role models to young women and men who are contemplating a STEM career. Jeannette Elizabeth Brown is the author of African American Women Chemists. She is a former Faculty Associate at the New Jersey Institute of Technology. She is the 2004 Société de Chimie Industrielle (American Section) Fellow of the Chemical Heritage Foundation, and consistently lectures on African American women in chemistry. Subscribe to only physics and chemistry articles on the OUPblog via email or RSS.